The current wisdom in the classical neural net theory holds that the only direct action of the electric field in neurons is upon voltage-gated ion channels, which open and close their gates for ions. The intraneuronal biochemical activities are thought to be modulated indirectly either by the entering in the cytoplasm ions that act as second messengers or via linked to the ion channels enzymes. In this paper we present a novel possibility for subneuronal processing of information by cytoskeletal microtubule tubulin tails and we show that the local electromagnetic field brings information that could be converted into specific protein tubulin tail conformational states. Long-range collective coherent behavior of the tubulin tails could transmit solitary waves in the form of sine-Gordon kinks, antikinks or breathers along the microtubule outer surface and the tubulin tail soliton collisions could serve as elementary computational gates that control cytoskeletal processes. The biological importance of the presented model is due to the unique biological enzymatic energase action of the tubulin tails, which is experimentally shown to control the sites of microtubule-associated protein attachment and the kinesin transport of post-Golgi vesicles. Microtubules are the main constituents of the cellular cytoskeleton together with microtubule associated proteins (MAPs), intermediary and actin filaments. Microtubules are hollow cylinders with diameter of 25 nm and are composed from tubulin α/β dimers. Each tubulin has nucleotide-binding site that binds single GTP molecule. The α-tubulin bound GTP is nonhydrolyzable while the β-tubulin bound GTP is hydrolyzed soon after the dimer is incorporated in the growing microtubule. The embedded in the microtubule lattice β-tubulin bound nucleotide, once hydrolyzed to GDP, cannot be further exchanged for GTP. However there remains a single layer of 13 GTP dimers at the microtubule plus end that acts as stabilizing �cap�. If one of these plus end β-bound GTP molecules is hydrolyzed fast microtubule depolymerization is triggered. This fast shrinking is known as a �catastrophe�. Usually biologists are attracted only by the dynamical instability of microtubules because it leads to reorganization of the cytoskeleton and therefore cellular morphology and functions. However in highly differentiated cells like neurons there is a stable population of cytoskeletal microtubules that could act as waveguides for subneuronally flowing information and at the same time perform the function of railroads controlling kinesin and dynein motors which distribute post-Golgi vesicles containing newly synthesized proteins. The idea for subneuronal processing of information performed by microtubules was originally suggested by Hameroff & Watt (1982) and further refined into a cytoskeletal automaton model (Rasmussen et al., 1990). The premise of the automaton model is that there is a mobile electron that could hop between α and β tubulin inside the dimer hydrophobic pocket. Further improving this scenario Tuszynski et al. (1995) developed a ferroelectric lattice model in which the direction of the vector representing the tubulin dimer dipole moment was supposed to depend on the electron hopping. The energy barrier for the electron hopping was estimated to be 0.4 eV for intra-dimer hopping and 1.0 eV for the inter-dimer hopping (Brown & Tuszynski, 2003). These high-energy barriers however make the suggested ferroelectric microtubule lattices apparently insensitive to the local cytoplasmic electric field, which is in the order 1-10 V/m for neurons (Georgiev, 2003). In contrast for reorientation of the tubulin dipoles in the Tuszynski model the cytoplasmic electric field intensity must reach the extreme biologically unfeasible magnitude of 106-107 V/m. Since in neurophysiology the main communication inside the neuron is achieved via passive and active electric signal transmission it is tentative to assume that if microtubules perform any kind of subneuronal computation they must input the local electromagnetic information first (Georgiev, 2003). The paradox of the apparent electric insensitivity of tubulin to the local electric field indeed comes from the improper biophysical modeling because all of the aforementioned models did not take into consideration the last 14-19 C-terminal aminoacid residues, which are highly acidic and bear 9-10 negative charges contributed by glutamate residues. These C-terminal �tubulin tails� project from the microtubular outer surface and could not be mapped by crystallographic x-ray studies, because of their extremely high sensitivity to the environmental conditions producing disordered image (Lowe et al., 2001). The inclusion of the tubulin tails in the biophysical model of microtubules allowed Georgiev (2003) to reveal a novel possibility for long-range microtubular communication in the form of tubulin tail sine-Gordon solitons. It was suggested that collision of kinks, antikinks and breathers could perform a form of subneuronal computation, which in turn is outputted by the tubulin tail energase action that controls MAP attachment and kinesin dynamics. In this paper we refine the mathematics stressing upon the importance of the ordered water molecule dynamics of the tubulin tail hydration shells. Furthermore we make ontological interpretation of our results in the framework of the elastic ribbon model (reviewed by Dodd et al., 1982) and we discuss the importance of the spontaneous symmetry breaking as mechanism for memory storage at the fundamental level of physical vacuum (Vitiello, 1995). The overall folds of the α- and β-monomers are nearly identical, composed of two β-sheets of six and four strands, flanked by 12 α-helices. Three functional domains have been assigned by Nogales et al. (1998) to each tubulin monomer: N-terminal, intermediate, and C-terminal domains. The N-terminal domain (residues 1-205) forms a Rossmann fold, which is typical of nucleotide-binding proteins. Helices H1 and H2 are on one side of the sheet, whereas helices H3, H4, and H5 are on the other. The intermediate domain (residues 206-381) contains a mixed β-sheet and five surrounding α-helices, among which H8 lies at the longitudinal interface between monomers. The loop connecting B7 and H9 in α-tubulin (also known as M-loop) makes strong lateral contacts between protofilaments in the assembled MT (Keskin et al., 2002). The C-terminal domain of tubulins has different length and structure in α- and β-tubulin but in general the C-terminal domain has a C-terminal helix H12 and a random coil C-terminal tubulin tail. Jimenez et al. (1999) determined the helicity of α(404-451) and β(394-445) tubulin C-terminal recombinant peptides with the use of NMR presenting illustrations with fourteen superposed α- and β-tubulin tail conformations. In α-tubulin molecule aminoacid residues 418-432 form the C-terminal helix H12 and aminoacid residues 433-451 comprise the α-tubulin tail. The α-tubulin C-terminal tail aminoacid sequence is EEVGVDSVEGEGEEEGEEY. The α-tubulin tail is 19 aminoacids long and possesses 10 negatively charged residues. The situation in the β-tubulin C-terminal domain is more interesting. Jimenez et al. (1999) have computed 9 aminoacid longer helix of the β-tubulin compared to previous PDB models (Nogales et al., 1998). This suggests an extension in the protein, supporting the possibility of a functional coil-to-helix transition at the C-terminal zone. The β-tubulin C-terminal helix H12 is formed by aminoacid residues 408-431 but it seems that the reversible transition between coil and helix of the last 9 aminoacid residues 423-431 from the C-terminal helix (with sequence QQYQDATAD) could either increase or decrease the length of the helix H12, in the same time decreasing or increasing the β-tubulin tail length! The β-tubulin tail aminoacid sequence (residues 432-445) is EQGEFEEEEGEDEA. It has 14 aminoacids and 9 negatively charged residues, but depending on the conformational status of the residues 423-431 the β-tubulin tail random coil can lengthen to 23 aminoacid residues bearing 11 negative charges. Following the C-terminal helices α-H12 and β-H12, the 19 and 14 C-terminal residues of the respective α- and β-tubulin tubulin tails are observed to be disordered by NMR but we would like to note that this is dynamical disorder and indeed is manifestation of the extreme sensitivity of the tubulin tails to the environmental conditions and local electric fields. Figure 1. Assembled �haired�13 protofilament left-handed 3-start helical microtubule (MT). Outer MT diameter of 22 nm, inner diameter of 14 nm, MT wall thickness of 4 nm, and tubulin tail length of 5 nm. Tubulin tails extending from each protofilament are visualized as rows of hairy projections. Image computed and produced with Wolfram�s Mathematica 4.0. In the presence of physiological pH inside neurons the tubulin tails project out from the microtubular outer surface and strongly interact with their hydration shells as well as with attracted positively charged Ca2+ ions from the cytoplasm. The strong coupling between the protein conformation and its hydration shell (Levitt & Sharun, 1988) is our motivation to mathematically model the solitonic interaction between the local electromagnetic field in neurons, the water molecule dipoles from the tubulin tail hydration shells forming a 4-5 nm layer on the microtubule surface and the tubulin tails. Tubulin tail conformational solitons could propagate along the outer microtubular surface providing a dissipationless mechanism for transmission of information. The soliton collisions could act as elementary logical gates and implement a subneuronal form of computation. The output of the computation can be ensured by the conformational status of the tubulin tails that determine the MAP attachment sites and control kinesin motor dynamics. Fujii & Koizumi (1999) have found that MAPs bind α-tubulin at amino acid sequence Lys430-Glu441 located in the end of the C-terminal helix α-H12 and in the initial segment of the α-tubulin tail. According to the same authors MAPs bind β-tubulin at amino acid sequences Tyr 422-Gly 434 located in the C-terminal helix β-H12 and the initial segment of the β-tubulin tail. Since these binding sequences are located just at the base of the tubulin tails which bear 9-11 negative charges it is reasonable to suppose that the conformational state of the tubulin tails will be the main regulator of MAP binding. Microtubule C-termini bind different MAPs � MAP2, MAP1 and tau and the specificity of this binding depends also on posttranslational modifications of the tubulin tails. Tubulin tails undergo several posttranslational modifications (Westermann & Weber, 2003): (i) tyrosination/detyrosination, (ii) generation of Δ2-tubulin, (iii) phosphorylation, (iv) polyglutamylation and (v) polyglycilation, so there is crosstalk not only between the tubulin tails and the local electromagnetic field but also between tubulin tails and the membrane bound G-protein receptors that trigger different intraneuronal biochemical cascade pathways (Georgiev, 2003). Some of the mentioned modifications (polyglutamylation and polyglycilation) produce bifurcations of the tails. Tyrosination/detyrosination is involved in tubulin crosstalk to intermediate filaments and cell differentiation. Generation of ∆2-tubulin (only α-tubulin) is marker for stable microtubules. ∆2-tubulin removes tubulin from the tyrosination cycle and could be marker for polyglycylation. Phosphorylation (better established for β-tubulin) is essential for neuronal differentiation. Polyglutamylation of α- and β-tubulin (up to 20 glutamate residues) is involved in the regulation of tubulin interaction with MAPs in neurons. Polyglycylation of α- and β-tubulin (up to 30-40 glycine residues) is essential for cytokinesis (severing residues of microtubules). We suggest that the mechanism of the tubulin tail action is via vibrationally assisted tunneling � a key concept emerged and experimentally verified in the last several years (Basran et al., 1999; Scrutton et al., 1999; Sutcliffe & Scrutton, 2000a; 2000b). A locally formed standing breather could promote or suppress conformational tunneling of molecule attached to the tubulin tail. The effect of vibrations on mixed-tunneling could be either to promote or to suppress the tunneling process and this depends on the boundary conditions (Takada & Nakamura, 1994; 1995). Formally the mechanism of tubulin tail breathing action is a form of enzymatic energase action. Energases do not have source of energy but rather induce conformational transitions in a molecule that has accumulated energy in an intermediate highly energetic conformational state (Purich, 2001). The accumulated energy is derived from hydrolyzed ATP or GTP in previous biochemical steps, for that reason it is usually called �primed energy� and the process is referred to as �priming�. Skiniotis et al. (2004) have experimentally shown that β-tubulin tail interacts with the kinesin switch II domain, while α-tubulin tail possibly interacts with kinesin α7 helix in a way that after the kinesin bound ATP is hydrolyzed the kinesin moves along the microtubule surface. Native microtubules that possess tubulin tails cannot be decorated by ADP-kinesin molecules because of the weak kinesin/tubulin tail binding, while subtilisin treated microtubules that lack tubulin tails bind stably ADP-kinesin thus blocking the kinesin walk. These experimental data suggest that the tubulin tails catalyze the detachment of the kinesin-ADP complex from the microtubule surface allowing the kinesin dimer to make a �step� along the microtubule protofilament. Analogous situation could arise if we consider the tubulin tail catalytic action upon phosphorylated MAP-2 molecules in dendrites. Local tubulin tail breather could catalyze the detachment of the MAP-2 molecule from the microtubule in dendritic projections starting cytoskeletal reorganization process. In axons the solitonic control of MAP-tau attachment could be both direct via catalysis of its attachment/detachment and indirect via decision on its phosphorylation status via attachment/detachment of microtubule bound protein phosphatase 2A (PP2A). Sontag et al. (1999) report that ABαC, the dominant brain isoform of PP2A is localized on microtubules, binds directly to tau, and is a major tau phosphatase in brain. The experimental findings indicate that structural interactions among ABαC, tau, and microtubules might control the phosphorylation state of tau. Disruption of these normal interactions could contribute significantly to development of tauopathies such as Alzheimer�s disease (it is well known that in Alzheimer�s disease brain tau is more heavily phosphorylated). Two energy eigenvalues of the former Hamiltonian are � � ε and � ε reflecting the fact that only the two principal energy eigenstates with energy difference ε are taken into account. This total Hamiltonian for the system of N water molecules and the quantized electromagnetic field in the region V inside the cell is essentially of the same form as a Hamiltonian for a laser system. Therefore, it can be expected that water molecules in the region V manifest a laser-like coherent optical activity, that is a water laser, if energy above a certain threshold is supplied. Here, A* denotes the adjoint operator of A.
for a continuous parameter θ. This transformation corresponds to a continuous rotation around the third axis and can be regarded as belonging to a continuous group or rotation SO(2) in the two-dimensional space. Here Qk0 is a constant taking a different value for a different value of wave number k, and u and w are also constants. Each spin variable sj = sjx,sjy,sjz describing the jth water molecule is found to be aligned in one and the same direction pointed by a constant vector (u,0,w). Such a long-range alignment of spin variables is nothing but a manifestation of a dynamical order of the system of the quantized electromagnetic field and water molecules. Namely, there exists a long-range order so that the spin variable of water molecules in the region V is systematized globally to realize the uniform configuration. It is interesting to see that this time-independent solution, representing a dynamically ordered state of the system of the quantized electromagnetic field and water molecules in the region V, is no longer invariant under the continuous transformation of canonical variables Eqs. (18)-(22). The aligned direction is transformed into another direction under such a continuous rotation around the third axis. Thus, a strange situation is realized in which the total Hamiltonian, governing the quantum dynamics of canonical variables, is invariant under a certain compact continuous transformation, whereas it admits to a stable time-independent solution which is not invariant under the same transformation. In quantum field theory, such a situation is known as spontaneous symmetry breaking (SSB) and the Nambu-Goldstone theorem in QFT asserts that in such a situation cooperative excitations of the symmetry attributes appear as long-range correlation waves and behave as bosons (Jibu & Yasue, 1997). They are called Goldstone bosons and in the actual case of coherent water electric dipole waves are called soft polaritons. Among the long-range order creating phenomena resulting from the interaction between the water dipoles and the local electromagnetic field we may find a specific one in which the collective dynamics of the water electric dipole field in the spatial region of linear dimension up to 50μm can give rise to cooperative emission of coherent photons given energy by certain systems external to the quantum system of electromagnetic field and water electric dipole field. If we want that this coherent emission of photons has biological impact upon tubulin tail energase action we should consider timescales comparable with the dynamical timescale of protein action, which is in the order of 10-15 picoseconds. In such case the collective dynamics has characteristic time comparable to that of thermally disordered dynamics and suffers from thermal fluctuation and dissipation. It will be shown that the laser-like emission of coherent photons can be realized even in such a case with thermal noise and loss provided that the electric dipoles of protein molecules (tubulin bodies) of the microtubule manifest a certain collective dynamics sufficient to �pump up� the water electric dipole field. Jibu & Yasue (1997) noted that in such case the Heisenberg-Langevin equation for water laser system requiring pumping could be of crucial importance. and ξ* and ξ are effective thermal fluctuations for the quantized electromagnetic field. with kB the Boltzmann constant. Briefly summarizing the mathematics we could say that the energy for the coherent photon pulse emission by the vicinal water in the proximal 4-5 nm of the microtubule outer surface could be gained from the tubulin electric dipole oscillations and/or microtubule wall vibrations. Above, the indices correspond to the usual combinations of the transversal direction of the electric field, and we supposed also that the longitudinal direction does not propagate. This is a variant of the well-known sine-Gordon equation. and is the velocity of the soliton. The biological importance of the suggested model is easily seen if we investigate the ontology hidden behind the mathematical equations. In brief, we have shown that the water dipoles from the tubulin tail hydration shells strongly interact with the local electromagnetic field. This interaction results in long-range ordering of the water molecule dipoles and Goldstone bosons, called soft polaritons, emerge to carry the information of this macroscopic order. The interaction of the ordered water dipoles with the electromagnetic field further leads to a coherent emission of photon pulses, which propagate via tunneling (Jibu & Yasue, 1997). The formed solitons are not dissipated by the thermal fluctuations, but could be pumped with energy if the energy supply is over certain threshold. Since the tubulin tails in the presence of physiological pH project out from the microtubule outer surface and are strongly coupled with their hydration shells, the propagating water dipole electromagnetic solitons will affect the tubulin tail conformational states. Thus the propagating electromagnetic soliton will be coupled to a protein conformational soliton physically propagating upon the tubulin tails. In turn the quantum dynamics of the tubulin tails manifested as soliton induced conformational change could control the attached MAPs and motor molecules (kinesin, dynein) via vibrationally assisted tunneling (and energase action). The 1-soliton solution in which we have chosen the positive root for γ is called a kink, and represents a twist in the variable which takes the system from one solution to an adjacent with . The states are known as vacuum states as they are constant solutions of zero energy. The solution in which we take the negative root for γ is called an antikink. We visualize the traveling water dipole sine-Gordon soliton solutions with the use of the elastic ribbon sine-Gordon model as discussed by Dodd et al. (1982). Here we take a clockwise twist of the elastic ribbon to be a kink with topological charge . The alternative counterclockwise twist with topological charge will be an antikink. Computer simulations were performed on Maple 5.1 with the use of the algorithms developed by Miroshnichenko et al. (2004). In our case the ontological interpretation of the line of blue arrows could be a protofilament with tubulin tails projected out from the outer microtubule surface. The surrounding water dipoles are visualized only at the place of local twist in yellow-green, which could be interpreted as the advancing electromagnetic pulse mode. Taking into account the results by Abdalla et al. (2001) we could say that the applied longitudinal voltage (i.e. voltage along the neuronal projection and respectively along the microtubule z-axis) results in generation and propagation of kinks or antikinks along the microtubule protofilaments. The tubulin tails are coupled to the vicinal water of the microtubule outer surface and they change their conformational status as the place of the soliton twist. The following animations represent the motion of the tubulin tails, where of course they could not make a full turn at 2π because of geometrical reasons. Instead tubulin tails could oscilate forth and back. The water dipole rotation at 2π however is possible and it is the water dipole rotations that is "projected" upon the tubulin tails. Animation 1. Traveling kink soliton represents propagating clockwise twist. The ontological interpretation of the line of blue arrows should be a protofilament with tubulin tails projected out from the outer microtubule surface. The surrounding water dipole ordering is visualized only at the place of local twist in yellow-green, which could be interpreted as the advancing electromagnetic pulse mode. Animation 2. Traveling antikink soliton represents propagating counterclockwise twist. The ontological interpretation of the line of blue arrows should be a protofilament with tubulin tails projected out from the outer microtubule surface. The surrounding water dipole ordering is visualized only at the place of local twist in yellow-green, which could be interpreted as the advancing electromagnetic pulse mode. The 2-soliton solutions of the sine-Gordon equation however suggest novel possibilities. The traveling kinks and/or antikinks pass through each other as if perfectly permeable, and the only observed effect is a phase shift. Since the colliding solitons recover their velocity and shapes such kind of interaction is called an elastic collision. Animation 3. Antikink-kink collision. The ontological interpretation of the line of blue arrows should be a protofilament with tubulin tails projected out from the outer microtubule surface. The surrounding water dipole ordering is visualized only at the place of local twist in yellow-green, which could be interpreted as the advancing electromagnetic pulse mode. Animation 4. Kink-kink collision. The ontological interpretation of the line of blue arrows should be a protofilament with tubulin tails projected out from the outer microtubule surface. The surrounding water dipole ordering is visualized only at the place of local twist in yellow-green, which could be interpreted as the advancing electromagnetic pulse mode. Another interesting 2-soliton solution is the possibility for coupled swinging kink-antikink solution called a breather. There are known three types of breathers: (i) standing breather, (ii) traveling large amplitude breather and (iii) traveling small amplitude breather. Of great interest for us could be the standing breather, which might be coupled to the energase action of the tubulin tails via vibrationally assisted tunneling. Animation 5. Standing breather is a swinging in time coupled kink-antikink soliton. The ontological interpretation of the line of blue arrows should be a protofilament with tubulin tails projected out from the outer microtubule surface. The surrounding water dipole ordering is visualized only at the place of local twist in yellow-green, which could be interpreted as the advancing electromagnetic pulse mode. Animation 6. Large amplitude moving breather. The ontological interpretation of the line of blue arrows should be a protofilament with tubulin tails projected out from the outer microtubule surface. The surrounding water dipole ordering is visualized only at the place of local twist in yellow-green, which could be interpreted as the advancing electromagnetic pulse mode. Animation 7. Small amplitude moving breather - looks exotically but has essentially a breather envelope. The ontological interpretation of the line of blue arrows should be a protofilament with tubulin tails projected out from the outer microtubule surface. The surrounding water dipole ordering is visualized only at the place of local twist in yellow-green, which could be interpreted as the advancing electromagnetic pulse mode. The standing breather soliton could be in vivo obtained in situations where the vector of the electric field acts perpendicular to the microtubule z-axis. If a local vortex of the electromagnetic field is born somewhere in the neuron then the exerted action of the electric field vector along the z-axis will be zero and no traveling soliton would be born. The standing breather swinging at certain tubulin tail (or breather formed by 2-3 coupled swinging tubulin tails) could catalyze MAP attachment/detachment and promote or inhibit the kinesin walk. Since we are interested in the mechanism for microtubular decoding of the information brought by the electromagnetic field let us discuss the geometry of the dendritic tree. It is well known that each neuron receives inputs from thousands of other neurons mainly via synaptic neurochemical transmission. Since each neuron inputting info to a given neuron K, can excite only certain postsynaptic spines s1, s2, �, sn, which possess unique geometric coordinates G(x1,y1,z1), G(x2,y2,z2),�, G(xn,yn,zn) we can be sure that given any specific synaptic activity pattern only unique set of traveling and standing tubulin tail conformational sine-Gordon solitons will be born. where is the velocity of the kink. If the old position of the standing breather is x1, after the collision the new position x2 will be . Further analyzing the situation we arrive at the possibility that the initial states of the generated set of standing breathers is analogous to a data input or �formulation of a given problem�. The dynamics of the electric field of the neuron will lead to sequential changes of the longitudinal electric voltages along the microtubular z-axis. The sequential generation of traveling kinks and antikinks along the microtubule protofilament will then implement elementary logical gates on the initial state of standing breathers so that their distribution will change in time along the length of the microtubule protofilaments. The process resembles a kind of processing of the initial data input. At certain time depending on the soliton collisions and the summation of phase shifts in time, any of the standing breathers could be established at a potential attachment place for a MAP molecule or kinesin motor. Depending on the time spent on this new position the swinging breather could catalyze conformational transition in the attached to the tubulin tail MAP or motor molecule (energase action). This will ensure an output of the proposed computational cycle. It should be emphasized that the input, processing and output steps were didactically separated for better presentation of the model. One should be aware that these three steps dynamically occur �all-at-once� i.e. there is constant generation of new standing breathers that undergo collisions and catalyze biochemical reaction when placed at the right position. Animation 8. Moving kink � standing breather collision results in a shift of the standing breather. The ontological interpretation of the line of blue arrows should be a protofilament with tubulin tails projected out from the outer microtubule surface. The surrounding water dipole ordering is visualized only at the place of local twist in yellow-green, which could be interpreted as the advancing electromagnetic pulse mode. Animation 9. Moving antikink � standing breather collision results in a shift of the standing breather. The ontological interpretation of the line of blue arrows should be a protofilament with tubulin tails projected out from the outer microtubule surface. The surrounding water dipole ordering is visualized only at the place of local twist in yellow-green, which could be interpreted as the advancing electromagnetic pulse mode. Finally we will make brief characterization of the potential places in neurons in which the electric field could act perpendicularly to the microtubule z-axis thus generating standing breathers. Usually neuroscientists consider only longitudinal voltages of neurons, but there are several places, which might form local electric field vortices. One of the most important places is the space under the dendritic spines (Georgiev, 2003). It was shown that under the dendritic spines the electric intensity vector acts in perpendicular direction to the microtubule z-axis. Figure 2. 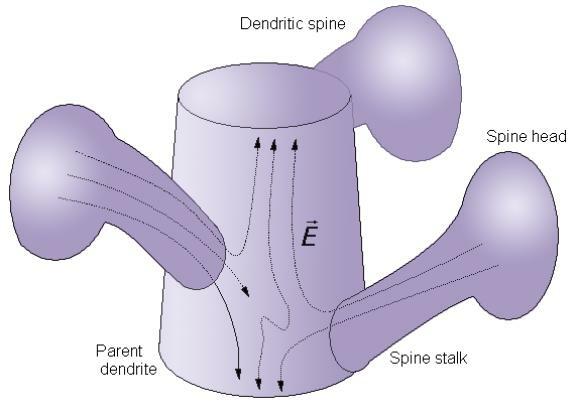 Under the dendritic spines the electric field intensity vector acts perpendicularly to the microtubular z-axis and might generate standing breathers. A second place in which the electric field vector acts oblique or perpendicular direction to the microtubule z-axis is the point of dendritic branching that usually is enriched in voltage-gated ion channels � the so-called �hot spot�. A �hot spot� is a place in the dendritic membrane that has specific lipid composition forming a �lipid raft� with specific protein clustering (e.g. voltage-gated ion channels). The current lipidology succeeded in the identification of several types (or classes) of lipid rafts, some of which are highly specific for neuronal membranes. Figure 3. Dendrite with �hot spot� (at the place of dendrite branching) acting in non-linear way allowing for sudden rush of sodium and calcium ions when the membrane voltage reaches a threshold potential. When active the �hot spot� creates a local vortex of the electric field acting perpendicularly to the microtubule z-axis. In the myelinated axons the places of interest are the nodes of Ranvier, which are enriched in voltage-gated ion channels and are responsible for the saltatory conduction of the action potentials (Georgiev, 2004). 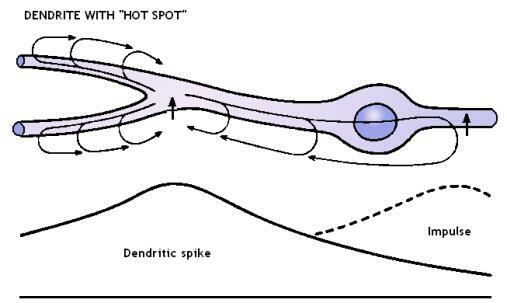 The axonal spikes have all-or-nothing biological behavior and theoretically the pattern of perpendicular to the microtubule z-axis electric spots will all look in the same way at every axonal spike. This could be of great use since for application of quantum computational algorithms one needs �blank registers� in which to copy the obtained information. In contrast to the classical case where one can safely erase intermediate steps from the computation, if we perform quantum computation we are not allowed to erase the intermediary �bulk of unnecessary qubits� that occurs in the course of the computation (Vedral & Plenio, 1998). Figure 4. Myelinated axon with nodes of Ranvier. The inward rush of sodium ions at the nodes of Ranvier creates a local distortion of the electric field that acts perpendicularly to the microtubular z-axis. And last but not least option is the recently discovered interaction between axonal collaterals via axo-axonal gap junctions. These fast over 200 Hz electric activities help in coupling of axonal firings between cortical neurons. So in such cases not all axonal spikes of a given neuron K will look in the same way, because some of the smallest axonal collaterals of the neuron K could be excited via gap junction coupling to adjacent firing axon. The rest of the axonal collaterals might not be affected because in retrograde direction the diameter of the axon increases and the current density flowing in retrograde direction could decrease very fast and fall below the threshold for triggering of an action potential. The suggested mechanisms for generation of tubulin tail conformational standing breathers as well as generation of traveling kinks, antikinks, and possibly large-amplitude or small-amplitude traveling breathers faces us with a novel possibility for direct interaction between the local electromagnetic field and the cytoskeletal structures in neurons. The possibilities for implementation of quantum computational schemes are to be assessed in future publications. I would like to express my sincere thanks to James F. Glazebrook (Department of Mathematics, Eastern Illinois University, 600 Lincoln Ave, Charleston, Illinois, USA) for the insightful discussions and the great help in presenting me the mathematical theory of the nonlinear wave equations. I am grateful to Kunio Yasue (Research Institute for Informatics and Science, Notre Dame Seishin University, Okayama, JAPAN) for sending me reprints of his work on quantum brain dynamics. Basran, J., Sutcliffe, M.J. & Scrutton, N.S. (1999). Enzymatic H-transfer requires vibration driven extreme tunneling. Biochemistry 38: 3218-3222. Brown, J.A. & Tuszynski, J.A. (2003). 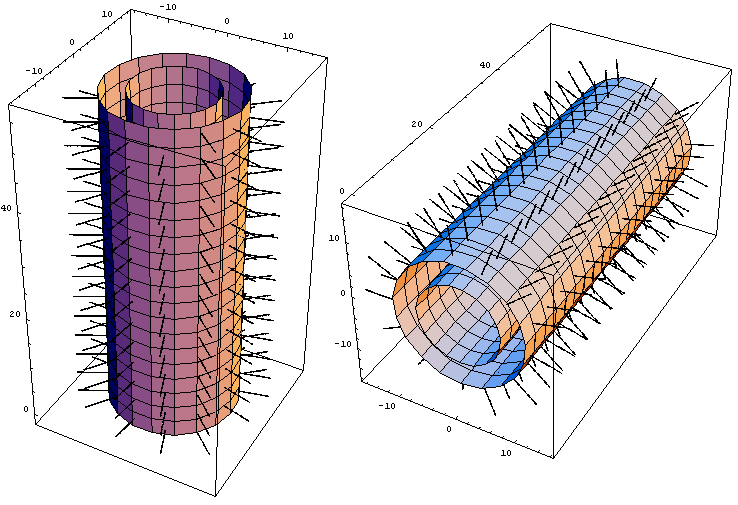 Calculation of the Electrical Conduction by Microtubule Protofilaments, Sheets and Cylinders. Submitted to Physical Review E.
Del Giudice, E., Preparata, G. & Vitiello, G. (1988). Water as a free electric dipole laser. Phys. Rev. Lett. 61: 1085-1088. Dodd, R.K., Eilbeck, J.C., Gibbon, J.D. & Morris, H.C. (1982). Solitons and Nonlinear Wave Equations. Academic Press, London. Fujii, T. & Koizumi, Y. (1999). Identification of the binding region of basic calponin on α and β tubulins. J Biochem (Tokyo) 125: 869-875. Hameroff, S. & Watt, R.C. (1982). Information processing in microtubules. Journal of Theoretical Biology 98: 549-561. Jibu, M. & Yasue, K. (1997). What is Mind? - Quantum Field Theory of Evanescent Photons in Brain as Quantum Theory of Consciousness. Informatica 21: 471-490. Jimenez, M.A., Evangelio, J.A., Aranda, C., Lopez-Brauet, A., Andreu, D., Rico, M., Lagos, R., Andreu, J.M. & Monasterio, O. (1999). Helicity of alpha(404-451) and beta(394-445) tubulin C-terminal recombinant peptides. Protein Science 8: 788-799. Keskin, O., Durell, S.R., Bahar, I., Jernigan, R.L. & Covell, D.G. (2002). Relating Molecular Flexibility to Function: A Case Study of Tubulin. Biophysical Journal 83: 663-680. Levitt, M. & Sharun, R. (1988). Accurate simulation of protein dynamics in solution (deviation from x-ray crystal structure/fluctuation amplitudes/hydrogen-bond stability). PNAS 85: 7557-7561. Lowe, J., Li, H., Downing, K.H. & Nogales, E. (2001). Refined Structure of α/β-Tubulin at 3.5 A Resolution. J. Mol. Biol. 313: 1045-1057. Nogales, E., Wolf, S.G. & Downing, K.H. (1998). Structure of the α/β tubulin dimer by electron crystallography. Nature 391: 199-203. Purich, D.L. (2001). Enzyme catalysis: a new definition accounting for noncovalent substrate- and product-like states. TiBS 26: 417-421. Rasmussen, S., Karampurwala, H., Vaidyanath, R., Jensen, K. & Hameroff, S. (1990). Computational connectionism within neurons:A model of cytoskeletal automata subserving neural networks. Physica D 42: 428-449. Scrutton, N.S., Basran, J. & Sutcliffe, M.J. (1999). New insights into enzyme catalysis: Ground state tunnelling driven by protein dynamics. Eur. J. Biochem. 264: 666-671. Skiniotis, G., Cochran, J.C., Mueller, J., Mandelkow, E., Gilbert, S.P. & Hoenger, A. (2004). Modulation of kinesin binding by the C-termini of tubulin. The EMBO Journal 23: 989-999. Sontag, E., Nunbhakdi-Craig, V., Leei, G., Brandt, R., Kamibayashi, C., Kuret, J., White, C.L., Mumby, M.C. & Bloom, G.S. (1999). Molecular Interactions among Protein Phosphatase 2A, Tau, and Microtubules: Implications for the regulation of tau phosphorylation and the development of tauopathies. Journal of Biological Chemistry 274: 25490-25498. Sutcliffe, M.J. & Scrutton, N.S. (2000a). Enzyme catalysis: over-the-barrier or through-the-barrier? TiBS 25: 405-408. Sutcliffe, M.J. & Scrutton, N.S. (2000b). Enzymology takes a quantum leap forward. Philos. Trans. R. Soc. London Ser. A 358: 367-386. Takada, S. & Nakamura, H. (1994). Wentzel-Kramer-Brillouin theory of multi-dimensional tunneling: General theory for energy splitting. J. Chem. Phys. 100: 98-113. Takada, S. & Nakamura, H. (1995). Effects of vibrational excitation on multi-dimensional tunneling: General study and proton tunneling in tropolone. J. Chem. Phys. 102: 3977-3992. Tuszynski, J., Hameroff, S., Sataric, M.V., Trpisova, B. & Nip, M.L.A. (1995). Ferroelectric behavior in microtubule dipole lattices: Implications for information processing, signaling and assembly/disassembly. Journal of Theoretical Biology 174: 371-381. Westermann, S. & Weber, K. (2003). Post-Translational Modifications Regulate Microtubule Function. Nature Reviews Molecular Cell Biology 4: 938-947.